Oh, the troubles that arise when grand lodges dabble in foreign lands. 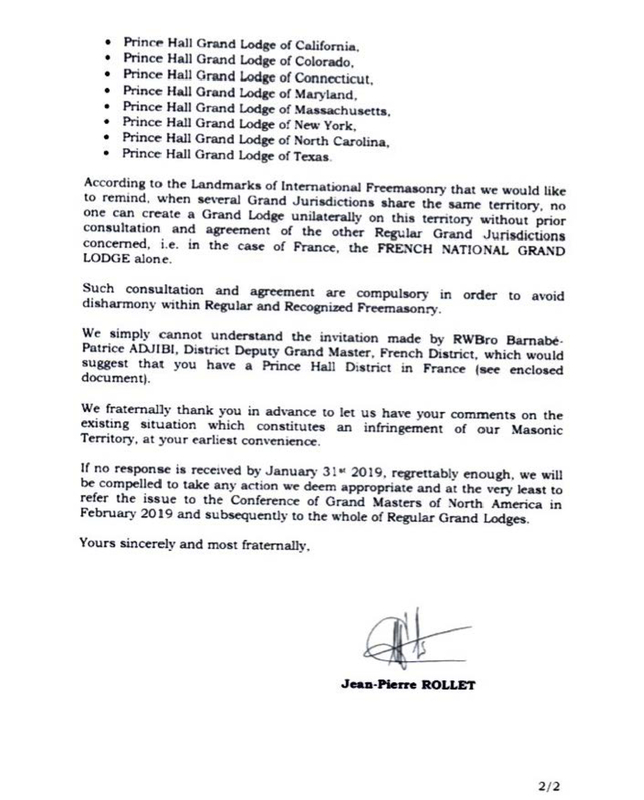 The Grand Lodge F&AM of Utah has voted at its annual communication this past week to suspend recognition of the Most Worshipful Prince Hall Grand Lodge of North Carolina over its chartering of lodges in foreign countries. Utah recognized the Prince Hall Grand Lodge in North Carolina back in 2009, and in fact, extended recognition before it was even requested. The current issue is one of irregular activity that North Carolina's new Grand Master has undertaken in Africa and France. The current website of the MWPHGLofNC lists among its chartered lodges: My Brother’s Keeper Lodge #847 in Lille, France; , Lafayette Lodge #851 in Paris; Heart Of Africa Lodge #852 in the Republic of Cameroon, Africa; Nelson Mandela Lodge #854 in Paris; and The Faith Lodge #855, also in Cameroon. This all came up at the Conference of Grand Masters of North America in Indianapolis last year in the 2018 meeting of the Commission on Foreign Recognition. They were informed that the sovereign jurisdictions of the Grand Lodges of the Congo, Cameroon, and Ivory Coast had been invaded by the Prince Hall Grand Lodge of North Carolina. It's gone a bit further now. 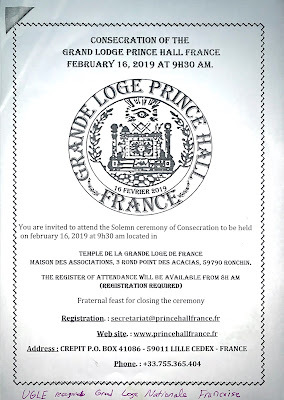 On December 28, 2018, the new Grand Master of Prince Hall North Carolina announced intent to consecrate the “Grand Lodge Prince Hall – France” and to “inaugurate the temple of Prince Hall Benin’s Lodge.” This announcement has met with resistance from the Grand Lodge of Ancient Free & Accepted Masons, Republic of Liberia, describing the conduct of Prince Hall North Carolina as unmasonic. 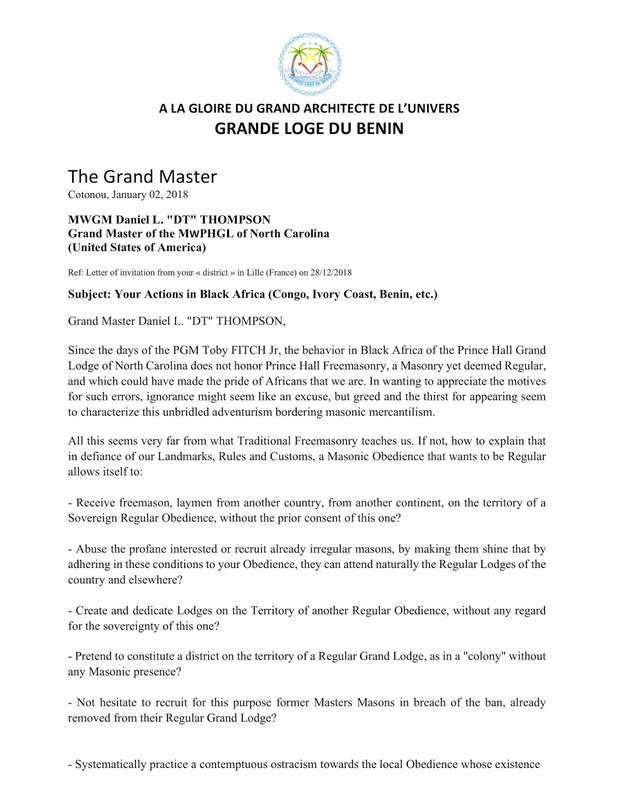 Not surprisingly, the Grand Lodge of Benin has described the behavior as irregular. 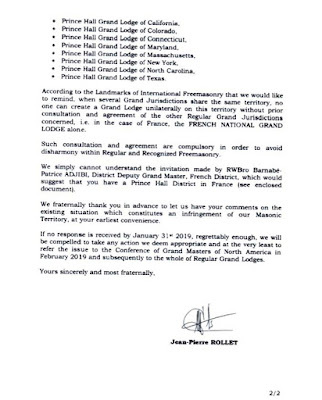 The Grande Loge National Francaise has been equally strenuous in their objection to Prince Hall North Carolina forming a grand lodge in their territory without consent. 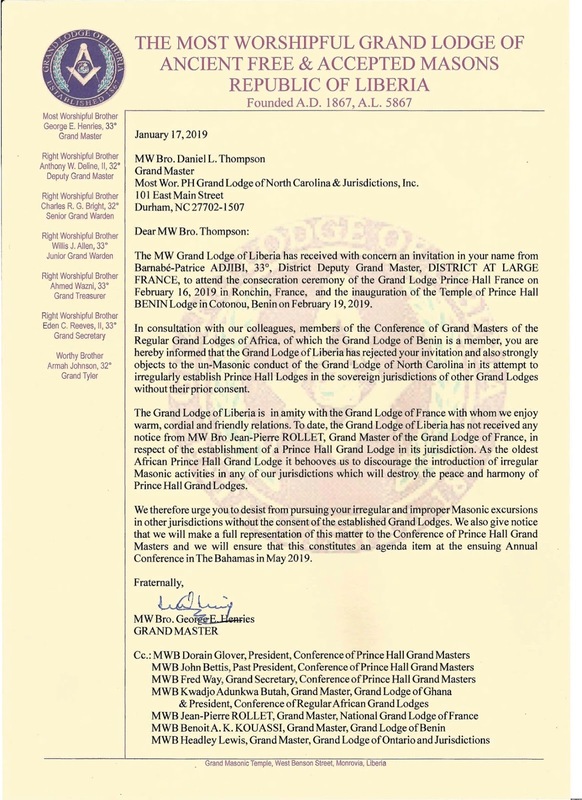 The Prince Hall Grand Lodge of North Carolina has clearly violated the jurisdiction of sovereign grand lodges, and is no longer practicing regular Freemasonry. It is therefore the recommendation of your Committee that this Grand Lodge suspend recognition of the Most Worshipful Prince Hall Grand Lodge of North Carolina until they remedy their illegal actions. Indeed, on the MWPHGLNC website, there is a 'District France' web page with little information on it HERE. If the issues are not resolved, there will be further brouhaha over it in the coming year. 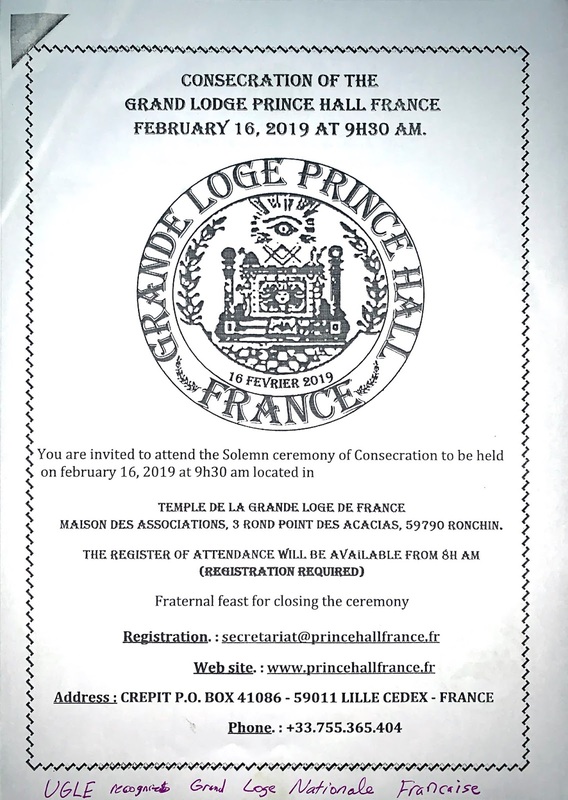 The Grande Loge Nationale Française will present more objections at the COGMMNA later this month, and at the very least, the Prince Hall Grand Lodge of Liberia will certainly be bringing it before the Prince Hall Conference of Grand Masters in May. I have written to Grand Master Daniel L. Thompson for some sort of statement or clarification that might shed some light on this matter, and will post it when or if he chooses to respond. 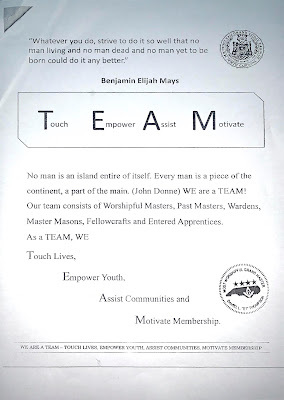 Interestingly, their grand lodge website quotes John Donne, saying "No man is an island entire unto itself..." Neither is a grand lodge when it comes to territorial claims. Why any American grand lodge or grand master would dip their toe into French Masonic territory, much less the patchwork quilt of competing territorial claims throughout the various African nations already carved up by various foreign Masonic bodies or that have their own grand lodges, escapes my comprehension. It would just be a shame if the Prince Hall brethren of North Carolina lost amity with more U.S. grand lodges over some quixotic foreign experiment. 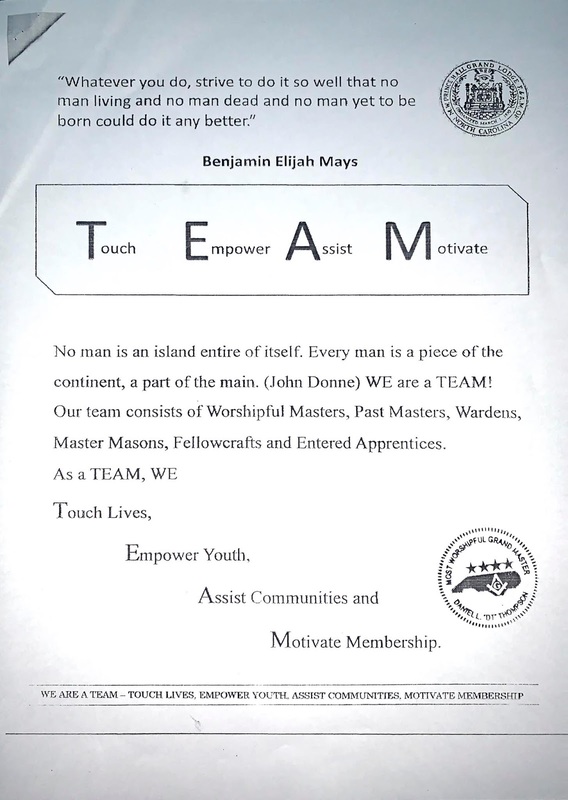 Lest anyone attempt to claim Utah is acting out of some other ulterior motives concerning Prince Hall Freemasons, bear in mind that they recently achieved amity with the Prince Hall Grand Lodge in Texas, and just extended an invitation for recognition with the Prince Hall Grand Lodge in the District of Columbia. No, this is about regular Masonic conduct that is expected of all Masonic bodies that are in amity with each other and seek to remain so. A question asked elsewhere is whether the GLNF or Liberia (or both, or any others) have withdrawn recognition of the MWPHGLofNC prior to Utah taking this action, which is a very fair question. I myself wonder if Utah jumped the shark by taking this action before the two aggrieved grand lodges involved did so. If so, this seems to be an unduly rash action on Utah's part, based on essentially two letters that were presented without any subsequent answers or statements by the PHGL of North Carolina or their Grand Master. Undoubtedly, there will be more information forthcoming. More documentation has been forwarded to me, and can be seen below. Click images to enlarge. Toby Fitch (left), declaring Samuel D.
Grand Lodge of Congo (est. 2015). 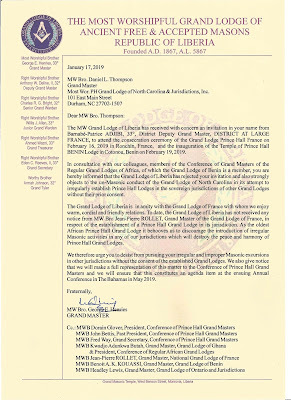 • An expelled Freemason named Samuel Badinga (expelled in 2017 by the Nationale Grand Loge du Congo) appeared in North Carolina in early summer 2018, and requested authority from the MWPHGL of North Carolina to charter a new lodge in the West African nation of Benin. Apparently, GM Thompson's predecessor, PGM Toby Fitch, was unaware of Badinga's expelled status, and granted the charter. 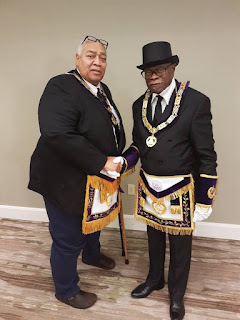 Badinga shows up on Facebook pages in July 2018 as the Grand Master of a recently established (2015) 'Prince Hall Grand Lodge of Congo,' which was consecrated by none other than the immediate Past Grand Master of the MWPHGL of North Carolina, Toby Fitch. 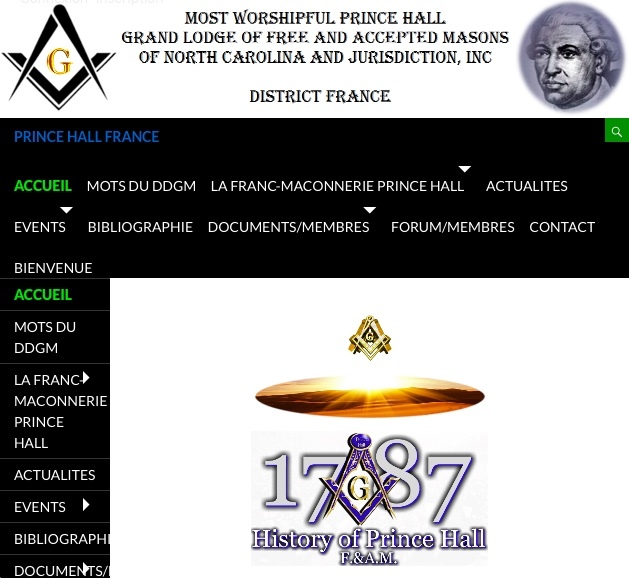 There are at least twelve grand lodges headquartered in Paris, several of which have lodges, often longstanding, in some of the overseas territories that Prince Hall North Carolina has now established lodges in. The complaining French grand lodge was itself placed by court order under the direction of a female magistrate, not a Mason, for a variety of irregularities. it is somewhat a child of the United Grand Lodge of England long vendetta against the Grand Orient of France, which is the largest French grand lodge and has many overseas lodges. As a result of that legal intervention and other bitterly contested issues, a large number of its members -- including some of great eminence and seniority -- withdrew and formed another quite substantial grand lodge in Paris which also has overseas lodges. Other grand lodges largely of African American origins which are not denominated as Prince Hall also have overseas lodges, one reason partly being the long association wth American military units of African-American grand lodges. The Liberian grand lodge mentioned after many travails has been recovering and repairing from a long period when some of its officers were associated with previous political misadventures. A number of the grand lodges mentioned have sometimes themselves been associated with the continuing French involvement in former colonies, with high government officials simultaneous serving as Masonic officers. 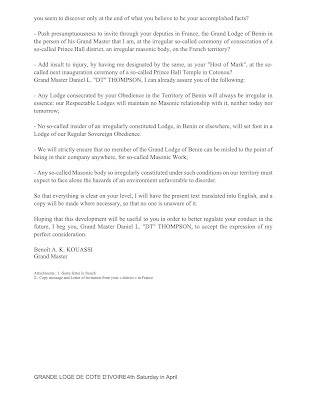 The grand lodge of Utah is itself not historically a stranger to recognition difficulties as for many years Masonry and Mormonism were at loggerheads, reconciliation finally being resolved and alleged resemblance of Mormon temple rites to Masonic rituals being left to antiquarians, but still debatable. and with some of the Mormon smaller non Salt Lake City denominations that dispute the authority of the large Salt Lake City body continuing the controversy. 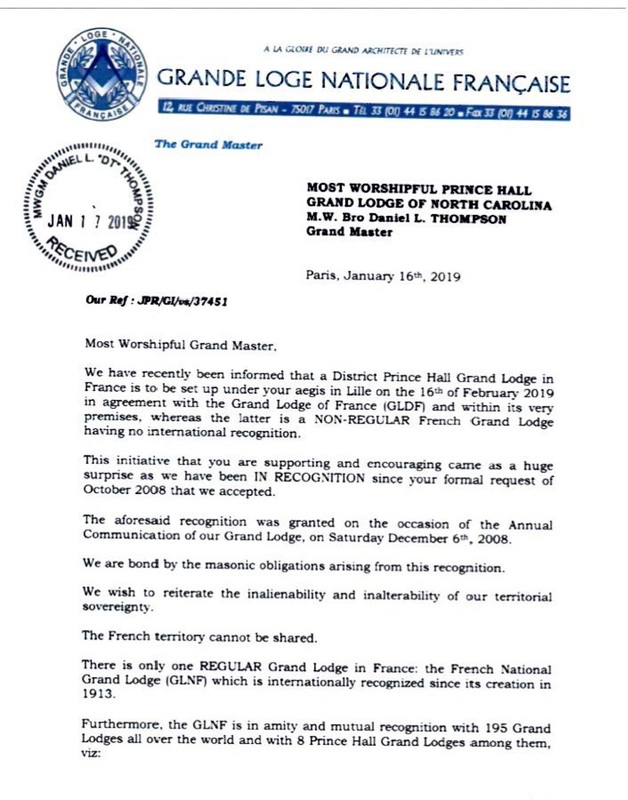 This is not the first time that Prince Hall Grand Lodges have found themselves in an uncomfortable tough spot over Masonic protocol and diplomacy. Back in 2012, the Grand Lodge of Texas went through a similar situation after extending recognition to the MWPHGL of Texas. 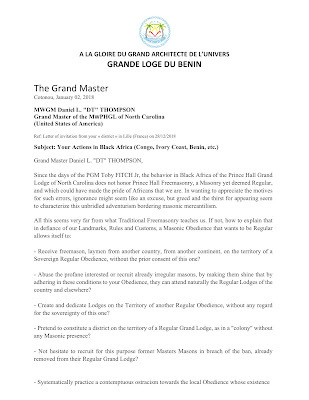 That PHA grand lodge had invaded the territorial jurisdiction of the GL of the Ivory Coast (Cote d'Ivoire), and the GL of the Ivory Coast contacted both the GL of Texas and the UGLE informing them of this invasion. Although Texas recognized the PHGL of Texas by Compact (treaty) at that time, that agreement did not provide for intervisitation between the two. Many outsiders believed this to be a defense mechanism between the two sides to stave off racial tensions. But in truth, the GL of Texas was quite eager to amend the Compact to allow for more, or complete, fraternal relations. However, when it was discovered that the PHGL of Texas had invaded the jurisdiction of another grand lodge that Texas already had fraternal relations with, Texas informed the Prince Hall Grand Master that they could not discuss greater fraternal relations as long as they continued to invade the Ivory Coast. The GM of the PHGL of Texas was upset over the interference, believing the mainstream Grand Lodge of Texas was poking its nose into his business. However, the Prince Hall Grand Master of Texas subsequently met with the GM of the Ivory Coast in Washington, DC during the annual Conference of Prince Hall Grand Masters. The interpreter for that meeting was the GM of the GL of DC (who I am told was originally from West Africa and spoke French as well as English). During that meeting, it was agreed that the PHGL of Texas would withdraw its charter from the Ivory Coast. 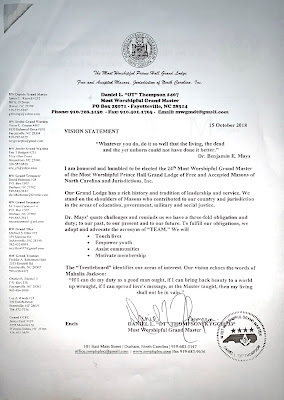 Since then,I have been told that the Most Worshipful Union Grand Lodge, Free and Accepted Masons, Prince Hall Affiliated, of Florida and Belize, Central America, Inc., subsequently issued its own charter to that same Ivory Coast lodge, once the MWPHGL of Texas withdrew theirs. This is but one of several reasons standing in the way of recognition between the Grand Lodge of Florida and that Prince Hall counterpart. Because of more than two centuries of segregation between black and white grand lodges in the US that didn’t start easing until the late 1980s, it is far too easy to make the knee-jerk assumption that racial animus is involved when a Prince Hall grand lodge gets in hot water and risks losing recognition all over again with a mainstream grand lodge. The serious truth is that Prince Hall Freemasonry operated in relative obscurity and isolation regarding the wider Masonic world for so long that suddenly conforming to the widespread accepted practices and protocols in force throughout the regular, recognized community carries more responsibility than they might have at first believed. And not every Grand Master likes being told there are other considerations outside his control that have to be weighed before acting unilaterally. Prince Hall Freemasonry has operated so many years without the support or approval of the so called Mainstream Grand Lodges and still are moving forward. 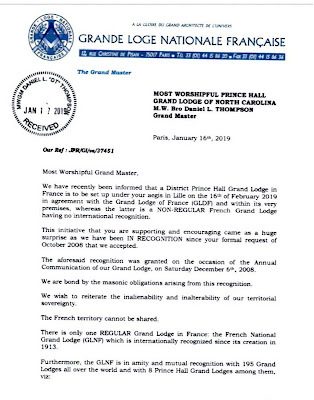 Prince Hall Masonry didn't ask for recognition on the contrary Mainstream Grand Lodges did . Prince Hall Grand Lodges isn't doing anything that hasn't been done before among Freemasonry. It sounds like Colonialism were Europen Grand Lodges trying to control various parts of Africa in some form or another. Prince Hall Masonry is Sovereign in its own rights .Our lineage goes back to the UGLE . Wait so when the GL of Congo protests that an american GL charters lodges in their country the European GLs are to blame? If I understand well, Africa is still a colony of European countries. I will consider that the Grand Lodge of Congo lays complains but GLNFnot really. Always wish to join the craft but I kind understand that even there, despite the good knowledge and education, we are still Africans and colons. What one must know, some educated brethren will be expelled from the lodge because they don't agree with political decisions. I mean unlawful decisions and therefore once expelled from the party, from the circle of decisions, except the church but they may be expelled also from the craft. Africans do not deserve to be Freemasons. African leaders' practices are not compatible with the teaching of the Freemasonry. Please prove me wrong. No the colony rule over africa went away during the 1900s. What the leaders practices have to do with freemasonry is something I dont understand, please clarify. Understand that I have only posted what material and facts I have been able to discover through my sources. There have doubtless been many other complaints filed with the MWPHGLofNC by other grand lodges of which I am unaware. I am told that both Fitch and Thompson have been counseled, advised, warned and more, not to do this by many respected Masons in the US, Europe and Africa. Instead of heeding that advice, they have pushed forward. Masonic diplomacy and international agreements of recognition and regularity are just like any other kind of diplomacy: complicated. When PHA Masonry operated in isolation from the outside Masonic world, their activities were largely ignored by the wider mainstream Grand Lodges. They were free to do as they liked. That has not been the case since the 1990s when PHA and mainstream grand lodges began seeking jolt recognition. PHA GLs initially sought recognition not from US, but from European GLs, as a way of seeking greater respect and legitimacy without dealing with the thorny issue of US racial politics and passions. But that recognition - especially now that it has expanded throughout the US, Canada and the rest of the mainstream world - carries with it responsibilities and baggage that PHA has not historically had to deal with. By taking these actions, MWPHGLofNC hasn't just risked losing amity with US GLs. Now it has messed with European and African territorial claims which are already a quagmire in those nations. (Try to make sense of Congolese grand lodges sometime - I triple-dog dare you). Further, flirting with expelled Masons and making them grand masters of your brand new grand lodge is the surest way to incite other Masonic bodies against you in five seconds flat. It's just a bad idea all around, and the various grand lodges involved aren't going to just sit by and ignore them over it. The MWPHGLofNC is going to lose its recognized status all over the world over this eventually, and go right back to being isolated in nothing but the Prince Hall universe all over again. If that's okay with them, that's fine. Just be aware of the ultimate way this could play out and be sure it's what is really desired. 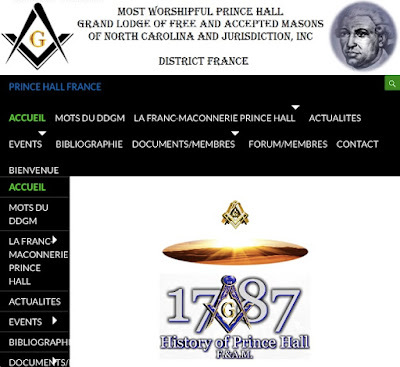 UGLE web site shows no Prince Hall Grand Lodges in Europe as regular. 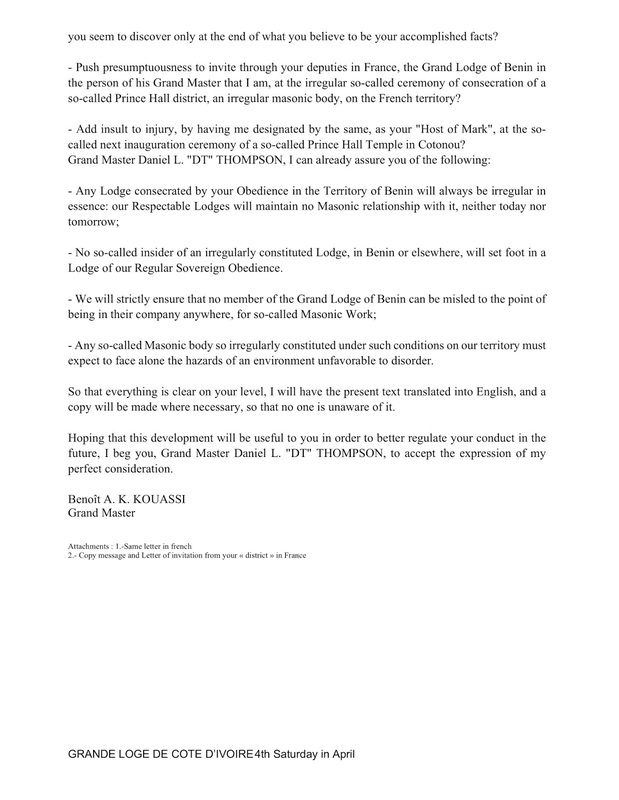 Therefore while the Prince Hall Grand Lodge of North Carolina is regular, any Prince Hall Lodge of North Carolina outside of North Carolina must be deemed to be irregular until recognised by the UGLE. To be fair recognition and regularity is based between Grand Lodges and not on individual lodges. So all of the lodges that the Prince hall grand lodge of North Carolina have the same status. This is the reason Utah did suspend recognition with the GL and not the lodges. How all of this is ever to be resolved is difficult to see. For example, when would all the Royal Arch bodies, even in the United States, let alone the world, recognize each other if their grand lodges did not. First the grand lodges would have to agree, and among the many issues between them there isnt even a beginning of discussion about African-American lodges that are not Prince Hall, some of which are historically on solid ground. Then as another example would membership in a non recognized Cryptic group relate to being present in a lodge or chapter that was recognized, or is that irrelevant. Factor in Mexico or Brazil with their multiple bodies and it becomes complex even without considering Europe. Is it enough to get grand lodges in harmony or does the proscription of not sitting with brethren who are from unrecognized bodies apply to their membership in ancillaries like an allegedly unrecognized or irregular chapter or preceptory.